Where can I find other reliable references about project management? There are many organizations that could provide you with relevant information about Project Management. One of the longest and most prominent professional organizations in Project Management is Project Management Institute. We would recommend you to go to www.pmi.org where you can find more information about Project Management. Who or what profession can apply project management? Project management is the application of knowledge, skills, tools and techniques to project activities to meet project requirements. It lets individuals speak with one common language despite their backgrounds, fields, or professions. With common language and understanding in Project Management, we believe all professionals and practitioners who are coming from any fields or professions can apply the knowledge. Therefore, Dcolearning does not specialize upon a specific professions. We have delivered programs, trainings, and PM exam preparations to many professionals coming from sales & marketing, IT, constructions, banking & financial services, retails, and NGOs. For-profit and not-for-profit organizations. Join our program and you will see it for yourself. Where and when can project management be applied? As Project Management (PM) has a common standard language, it can be applied in any business sectors and industries at any point of business/company stage whereas investments are delivered, developments are made, and initiatives are implemented. PM can help businesses in saving resources during a project delivery or during the implementation of initiatives. PM can reduce risks of project failure and increase the success rate. By understanding PM, an individual can denote where and when the project is facing a potentially high risk. PM also offers the ‘know how’ in rescuing or ‘salvaging’ the project. When PM is implemented in the appropriate means, PM will contribute to the bottom line of the company/businesses. Why do you think I need to know about project management? The challenges for most of professionals in today’s business are how to manage various (but most of the times are limited) resources and how to deliver and realize those resources into targets set by customers/ stakeholders. Such targets are often set into projects deliverables and outcomes. More and more organizations nowadays are using “management by project” than in the past years. Which means more organizations will drive their businesses based on their project successes. It is why we believe that Project Management skills is key to for all management practices and professionals. If you are in a business or in an organization setting, Project Management offers you the flexibility and better insights on how you can ‘deliver’ your targets accordingly. We embrace Project Management Institute (PMI)’s definition of a project. It is “The application of knowledge, skills, tools and techniques to project activities to meet project requirements”. And this nature fits with the current development of more businesses and organizations develop their businesses into projects. As a Registered Education Provider (R.E.P.) of PMI, Dcolearning consistently holds its understanding of project based on PMI’s standards and guidelines. It is one major organization that has a long experience and proven track record in setting a globally accepted standards for many businesses and industries. About Public Training program; Does Dcolearning offer one? Yes, besides our most sought program, In-company learning program, we do also offer a public training program.This public program is popular among individuals and professionals who want to learn about project and project management in their own preferred time. The public training program is regularly scheduled as you can see on our Annual Public Training Schedule. We also receive public group registration (with a minimum of 5 people in the same class), as a By-Request Class, whereas a group of individuals/professionals (not necessarily coming from a company) book a training program schedule for their own and at their own preferred time and place. You can contact our team for more information. About In-House Training program; Can Dcolearning deliver one? How? Yes, we certainly have it. It is one of our most sought after programs. Due to its flexibility in tailoring the program courses based on specific company needs. The program can be delivered in the client’s premises or we can help you to arrange the program as per your company’s preference. We could also offer combined/integrated services such as coaching, internal testing services, and we could also provide variety of workshops from short-termed up to year-long programs to our clients. As different organization has different needs, therefore we would recommend that our team meet with the representatives from your company to define the most appropriate format and type of program for your company. Who will facilitate this Dcolearning program for me? All Dcolearning programs will be facilitated by Project Management practitioners who came and have experiences from various industries. All Dcolearning programs are well maintained and supervised by certified Project Management Professional (PMP)® and PM expert partners to ensure the quality of program delivery. For in-house programs, we could recommend the most suitable facilitator or based on the client’s preferences. Why do you think I need to know about PM? Based on years of experience gained by our team and our facilitators, a balanced mix of theoretical knowledge and practical approaches is essential. Therefore, Dcolearning programs are designed with the combination of theoretical knowledge and practical approaches, so that by the end of the program, participants will understand and will be able to directly implement the knowledge gained from the program into their daily job. The case study used in the programs, public and in-company program, is a practical and based on real-case scenario. By using this case, all participants will be able to relate it with their daily project assignment back in their office. The Dcolearning facilitators are also practitioners who have a balanced mixture of theorical knowledge and strong practical experience in project environment with small and large projects. Our facilitators are coming from various background ranging from business/management consultation, non-government, IT, retail, to banking and financial business projects. Certainly, Dcolearning program participants will get a hands-on knowledge and skills. What will I get from a PM training? Project Management (PM) is the application of a thorough set of knowledge and skills. Therefore there is no simple course in Dcolearning training programs. The programs you will have will be based on the international standard of project management from Project Management Institute (PMI)®’s Project Management Body of Knowledge (PMBOK®Guide). For details on the knowledge and practical approaches offered in Dcolearning training programs, contact our team and let’s discuss this further. We are happy to share. PM training at Dcolearning is an experience of its own, where participants will get full attention during training and after training. Dcolearning has a facebook account where the alumni can take their time to share stories and experience or to get back in touch with Dcolearning team and facilitators. Dcolearning-ATV directly holds R.E.P status. What does it mean? It means Dcolearning-ATV directly acts as a PMI’s R.E.P. without other (third party) institutions’ involvement or simply, we do not use/borrow other institution’s R.E.P. status for managing our own programs. Dcolearning-ATV can issue and modify training programs if we deem necessary. This status really shows our commitment as an R.E.P. that abide with the standard of practices required by PMI. Based on our long experience, it is the test for any training institutions to join this R.E.P. status due to its requirements and cost involved to become one. We believe you, our clients and partners, deserved this kind of commitment. How can we know that a provider directly holds an R.E.P. status? Is there any other programs beside PM training/workshop? Yes, there certainly are. As our commitment in aligning our training program portfolio with PMI Talent Triangle, starting in Q4 2016 we have added several programs that cover leadership, interpersonal skills, and strategic & business management subjects. We work with partners and our business group to continuously expand our program portfolio that will provide the most comprehensive professional development programs specifically for Project Managers, Project Members, and the entire Project Management team. Up until now, we are the only R.E.P. in Indonesia that focuses on project management professional development programs. We have more than 20 programs, and still growing, that will help project professionals to equip themselves with skills that enable them to achieve higher chance of project success and for them to move up the career ladder through project management capabilities. Please contact our team for further information on this matter. Why should I take Dcolearning's PM training program? There are too many reasons to list them all here. Dcolearning focuses only to Project-Management-related training programs with globally accepted standard in project management. We are a Registered Education Provider (R.E.P.) of Project Management Institute. An REP has gone through a rigorous and serious process in order for us to be formally recognized by PMI itself. It requires commitment and continuous as well as sustainable operation. As an REP, we are also bound by ethical standard and regulations that PMI requires from us. By focusing our operation as only a training provider, we are in an unbias position when we are talking about other Project Management professional services after the training programs. Participants and companies and organizations can have many perspectives and inputs about other project-management-related services such as consultancy or tools or any other products or services. As an REP we are supported by internal and external partners of project management professional networks. It enables us to provide sustainable and comprehensive offers with enough flexibility to adjust with your schedule and other requirements in delivering training programs. We are one of few REPs that supported by both Project Management and T&D professionals within our team. We constantly improving ourselves on both areas as we believe to give better programs, it requires a combination of both worlds for our clients. What is Dcolearning's expertise in PM and its training? Dcolearning focuses on the project managers’ skill-set that will enable them to perform and to achieve their professional & company’s strategic objectives through the achievement of their project. This focus on project manager’s professional skills development what sets Dcolearning apart from the crowd. We are now only providing training and workshop programs with no intention to cross-sell it with any other services such as consultancy or technology implementation or any non-training services. We believe that through a various-point-of-views approach in our training program, our clients and students can have better view of what types of services that may work and may not work in their project context. Our facilitators will give their opinions and experiences with unbias approach that every participant can ponder to and deliberate after the training program. What is Dcolearning experience in PM training? Our team, our facilitators, and our group have delivered PM programs and its complementing programs to hundreds of companies and to thousands of professionals in Indonesia. Dcolearning has the experience of delivering the wide range of Project Management (PM) into many business sectors such as sales & marketing, IT, constructions, banking & financial services, retails, NGOs, and other national and multinational companies in Indonesia. If needed, our comprehensive list of clients and partners is available upon request for your organization perusal. 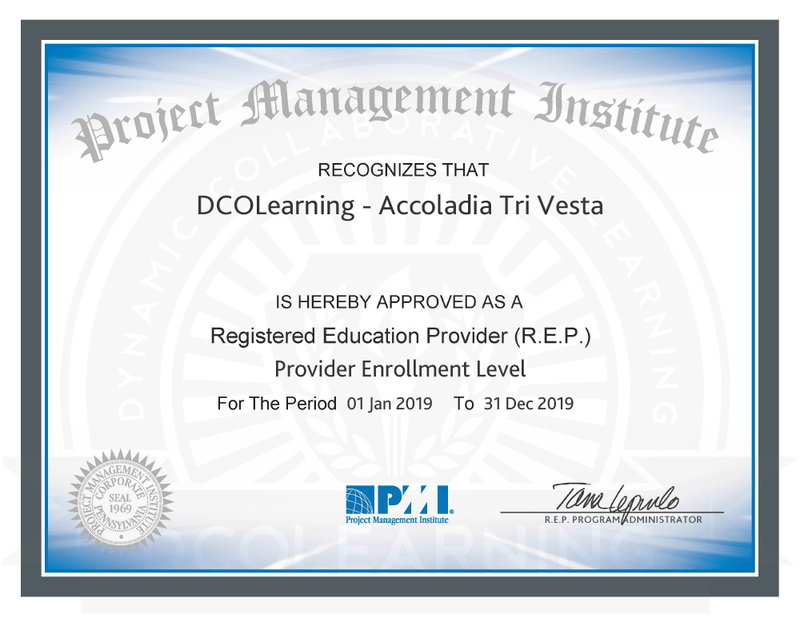 Dcolearning is a training provider, a professional development unit, dedicated on the project management area that aligned with Project Management Institute (PMI)’s Talent Triangle model. Our team is supported by a dozen T&D professionals and more than 20 professional trainers and Project Management Professionals (PMP) as our internal and external delivery team. From Q4 2016, Dcolearning is under the management of Accoladia group. Formasi Accoladia Group is a business group that focuses on the improvement of Indonesia’s professionals. Accoladia group, through its business units, is now one of key players in Indonesia’s professional development providers, serving hundreds of companies and thousands of professionals through its training programs each year. Our group supports and believes in Dcolearning vision and missions that put the emphasis in developing and improving the human capital, and also in promoting and disseminating knowledge and skills of project management to professionals as well as businesses & organizations. Why Dcolearning does not offer other services like other providers? Yes, we have received many questions about this. And no, Dcolearning does not offer other services such as PM consultancy, advisory, outsourcing, PM tool & implementation, and so on, like other PM service providers. This decision has been taken by our partners after more than a decade of experience in Indonesia project management landscape. Our partners have been working with many professionals and clients while maintaining and managing the professional development side of PM business in Indonesia. It is clear and deliberate decision for us to take. And with the development of PMI’s Talent Triangle, our team has decided to stay true to our core values and identity. We believe the realization of PMI’s model requires a different kind of commitment and different kind of operation. Professional development and education operation to provide better scale and attention that truly covers the PMI’s Talent Triangle model will require a certain kind of acceptance and understanding that a combined-PM-services may face a challenging time to perfect it. We have been there and done that. We offer a different kind of mindset and mentality in our view. To provide better service. Better result. Better engagement. With this choice, our team is committed to develop a more comprehensive and more value-adding programs by focusing ourselves in the professional development side of project management areas. With this focus, we believe we can provide better programs, unbiased services, and more sustainable program and business for our stakeholders and clients. With our current operation, it enables us to be supported by internal & external facilitators who are truly project management professionals with hands-on experience in managing projects or programs. All of our facilitators have corporate-level project experience with significant amount of project budgets and in various business settings as well as various industries/sectors. We believe that every business has their own calling and values, so we believe that this is ours that we can be accounted for in our operation and delivery. And lastly, we believe it as our strength in this area. It is for you, our clients, to decide what is best for you to engage with. Dcovalley is the brand of Dcolearning’s Virtual Learning Environment developed for Dcolearning’s program alumni. It is an eLearning system managed by Dcolearning team with the support of Accoladia Group. It serves as a repository facility to store Dcolearning program materials. It supports our program alumni needs to revisit their materials, access other supporting materials, and for those who are preparing the CAPM®/PMP® certification examination to have a simulation of their tests. A virtual learning environment (VLE), or learning platform, is an e-learning education system based on the web that models conventional in-person education by providing equivalent virtual access to classes, class content, tests, homework, grades, assessments, and other external resources. It includes a content management system. Virtual learning environments are the basic components of contemporary distance learning, but can also be integrated with a physical learning environment which may be referred to as blended learning. E-learning (or eLearning) is the use of electronic media and information and communication technologies (ICT) in education. E-learning is broadly inclusive of all forms of educational technology in learning and teaching. E-learning is inclusive of, and is broadly synonymous with multimedia learning, technology-enhanced learning (TEL), computer-based instruction (CBI), computer-based training (CBT), computer-assisted instruction or computer-aided instruction (CAI), internet-based training (IBT), web-based training (WBT), online education, virtual education, virtual learning environments (VLE) (which are also called learning platforms), m-learning, and digital educational collaboration. What are the benefits of using Dcovalley? It collects and stores all materials and data related to the training programs that a company has conducted over the years. The administrator can curate the suitable and appropriate supporting materials to the training programs. It is a password-protected environment, so it secures the data. Ease the reporting and evaluation process for the upper management on the training programs. With Dcovalley, training management does not have to build their own eLearning platform for project management. In a transition period with the new training management team, the materials are still accessible to new training team without losing valuable lessons learned. It is an additional and a complementary service to Dcolearning face-to-face workshop program. It’s FREE. Alumni can revisit the training materials they got in the classroom sessions. It is a curated environment so alumni can get access to other supporting materials related to their previous training program(s) with Dcolearning. Get in-depth knowledge on the subject that was not possible to get in the classroom sessions. Test their knowledge in small tests and quizzes. For CAPM®/PMP® certification preparation or CAPM®/PMP® Fast Track alumni, they can have access to significant pool of exercise questions to practice and to simulate their close-to-actual examination test. Dcovalley offers simulation tests in electronic and conventional pdf-ready-to-print formats. The alumni can conveniently choose their preferred approach. Dcovalley can be accessed via internet using various channels, be it your PC, laptop, tablet, or even smartphones*. Should I pay for using Dcovalley? No. It is free. As long as you are an alumni of our program you can request access to our Dcovalley system. How long is the access? Can I extend the access? You have 1 year access to Dcovalley once you completed the classroom sessions. And YES, you can extend the access by taking another program with Dcolearning. Should you or your company needs customized or specific access duration after the program, please do not hesitate to contact our team. I am not an alumn, can I pay for the access? No. At this moment, our group’s policy stated that the access to Dcovalley is only for Dcolearning program alumni and our corporate clients’ HR & Training Partners. Can I opt out using it and get a discount for my program? Yes, you can opt out but it will not change the fee of your program since it is an additional extra service from Dcolearning. It is free so there is no discount in any form of our training programs’ investment if you choose to opt out. Can I access it before my classroom training program? No. At this moment, our policy is that the access to Dcovalley can only be given after you completed your classroom training program with us. Unless you are our previous program alumni taking a new program at Dcolearning. Can you provide a customized internal PM testing? Yes we can. Our team can utilize our Dcovalley-like system for you and your company to set up. A PMP-or-CAPM-like exam test is ready for you to use so your company can assess your team readiness in project management knowledge and case study simulation. Can you guarantee me to pass my PMP Exam? Lately we received many questions related to this matter, and our answer is always a firm NO. As an R.E.P we are prohibited to guarantee any candidates, who took our preparation programs (CAPM®/PMP® Exam Prep or CAPM®/PMP® Fast Track), that they will pass the exam. There are many aspects involved when a candidate took the exam. Some we are in control of them, some are not. It is unwise for us to give such over-promises. And our team and management is very firm in not giving certain “Terms & Conditions” in the case of this serious professional certification process such as PMI’s certifications. What we offer them are the supports to make them have better chance in passing the exam through our in-training and especially through our post-training sessions, such as membership and registration supports, Dcovalley sessions, etc. We consider our alumni as adult professionals who need to make a strong and best commitment in preparing themselves to go through this certification process. And we are going to stand by them through the process. Engage with us and see the difference. Can I get my PMBOK® Guide in softcopy format? You can get a softcopy of the latest edition of PMBOK® Guide by joining PMI membership. We can help you in its registration process, please contact our team. There is no other way to get the softcopy of PMI’s PMBOK® Guide. What are your facilitator qualifications? Since adopting PMI’s Talent Triangle model program, we combined our team of facilitators from PMI-certified and non-certified ones. For PMP-and-CAPM-bound programs, our internal and external facilitators are PMP-certified professionals who have actual project management experience (non-consulting) in their corporate assignments. PMP-certification-mandatory requirement of our facilitators ensures the alignment of our programs with the PMI standards. For certain Technical Project Management, Leadership and Strategic & Business Management subjects, our facilitators must hold a certification in their respective area to ensure the quality and understanding in their fields. ALL of our facilitators must have a minimum 10 years of working experience and have hands-on experience in managing project at their corporate (non-consulting) assignments. Why non-consulting experience? Our partners believe that, as project management professionals, as you are all well aware, it is a very different experience when you are being accountable for the success of a project in its entirety than a person who are on the side and merely advise how to achieve the project success. Visit our Facebook Page to see our latest training photo documentation and get the feel. *PMI, PMP, CAPM, Project Management Professional (PMP), Certified Associate in Project Management (CAPM) and PMBOK are registered marks of Project Management Institute, Inc.
For more information and schedule arrangement of group registration (for any of workshop programs above), please contact our team.